Terry Edward Branstad (born November 17, 1946) is an American politician, university administrator, and diplomat serving as the United States Ambassador to China since 2017. A member of the Republican Party, he previously served as Governor of Iowa. Branstad also previously served three terms in the Iowa House of Representatives from 1973 to 1979. Branstad served as the 39th Governor of Iowa from 1983 to 1999. After his retirement from politics, he served as President of Des Moines University from 2003 to 2009. In 2010, he returned to politics to run for Governor again, defeating incumbent Chet Culver to become the state's 42nd Governor. He was reelected to a sixth overall term in 2014. In December 2015, he surpassed New York's George Clinton as the longest-tenured Governor in American history. 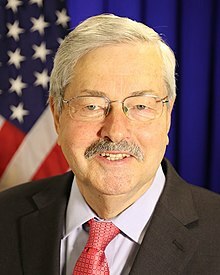 In December 2016, Branstad accepted President Donald Trump's nomination as United States Ambassador to China, a position he was confirmed and sworn into in May 2017. Upon his resignation as Governor, he was succeeded by Lieutenant Governor Kim Reynolds, who became Iowa's first female Governor. Branstad received a Bachelor of Arts in political science from the University of Iowa in 1969 and a Juris Doctor from Drake University Law School in 1974. After getting his undergraduate degree, he was drafted and served in the United States Army from 1969 to 1971, serving as a military policeman in the 503rd Military Police Battalion at Fort Bragg, and was awarded the Army Commendation Medal for meritorious service; he once recalled that he arrested actress Jane Fonda for coming onto post at Arlington National Cemetery, where she was planning to attend an anti-war protest. Branstad served three terms in the Iowa House of Representatives from 1973 to 1979 and served as the Lieutenant Governor of Iowa from 1979 to 1983, the year he was elected Governor of Iowa. When elected governor at age 36, Branstad became the youngest chief executive in Iowa's history. Reelected in 1986, 1990, and 1994, and ultimately serving four consecutive terms, he left office as Iowa's longest-serving governor. He served as Chairman of the National Governors Association during 1989–1990, and also was Chair of the Midwestern Governors Association. In 1997, he chaired the Education Commission of the States, the Republican Governors Association, and the Governors' Ethanol Coalition. In 1983, he vetoed a bill that would allow a state lottery. Iowa's unemployment rate went from 8.5% when he took office to a record low 2.5% by the time he left office in 1999. In his first year as governor, the state budget had a $90 million deficit. It took several years until the budget was balanced. He said that he did not have enough support in the legislature to approve budget reforms until 1992. By 1999, Iowa had an unprecedented $900 million budget surplus. Branstad focused most of his efforts on endeavors outside of politics when he left office in early 1999. He founded Branstad and Associates, LLC and was also a partner in the firm of Kaufman, Pattee, Branstad & Miller, and a financial advisor for Robert W. Baird and Co. In August 2003, Branstad accepted an offer from Des Moines University to become its president. On October 16, 2009, he announced his retirement from Des Moines University in order to run again for governor. Branstad was appointed by President George W. Bush to chair the President's Commission on Excellence in Special Education. The commission was charged with developing a plan to improve the educational performance of students with disabilities. After completing his work with the commission in 2003, he was asked to serve as a member of the National Advisory Council for Positive Action for Teen Health, or PATH. The advisory council encourages action toward detecting adolescent mental illness. In April 2003, he was named to serve as a public member of the American Institute of Certified Public Accountants, which comprises both professional and public members who address a variety of issues related to the profession. Branstad serves on the boards of, among others, Conmed Health Management Inc, American Future Fund, the Iowa Health System, Liberty Bank, the American Institute of Certified Public Accountants, and Living History Farms. On August 2, 2009, The Des Moines Register reported that Branstad was actively considering seeking the Republican nomination for governor. On October 7, 2009, Branstad filed papers to run for governor in the 2010 election. According to a poll conducted in September 2009 by The Des Moines Register, he maintained a 70% favorability rating from Iowans as compared to Governor Chet Culver's rating of 50%. On June 8, 2010, Branstad won the Republican gubernatorial nomination, but when opposing candidate Bob Vander Plaats conceded, he did not endorse Branstad. The Des Moines Tea Party gave Branstad a "no" on their report card regarding "criteria for acceptance" and said Branstad had "a history of raising taxes, [was] not a true conservative, and increased the size of government every year he held office, [and] built a state-owned phone company." Branstad was accused by former Iowa State Auditor Richard Johnson of keeping "two sets of books" on the state budget when he was governor. Johnson said Branstad needed to be "transparent" to Iowa voters about the reporting of Iowa's finances during his tenure as governor. Branstad ran for reelection in 2014. He was opposed in the Republican primary by Tom Hoefling, a political activist and nominee for President in 2012 for both of America's Party and American Independent Party. Branstad won the primary with 83% of the vote. For the general election, Branstad faced Democratic nominee State Senator Jack Hatch and won the election with 59% of the vote. In June 2013, Branstad signed into law a sweeping tax reform bill that garnered widespread bipartisan support, passing the Iowa Senate by 44 votes to 6 and the Iowa House by 84 votes to 13. The bill, entitled Senate File 295, provided for the state's largest tax cut in state history, including significant property tax reforms – estimated at $4.4 billion at the time of signing – as well as an estimated $90 million of annual income tax relief, in part in the form of an increase in the earned income tax credit. The bill also included significant reforms to education and healthcare. In a June 2013 analysis by The Business Journals looking at 45 of the country's 50 governors by their job creation record, Branstad was ranked number 28. The five governors omitted from the analysis all assumed office in 2013. The ranking was based on a comparison of the annual private sector growth rate in all 50 states using data from the U.S. Bureau of Labor Statistics. On April 13, 2017, with large Republican majorities in the Iowa legislature, Branstad signed a bill into law expanding gun rights in Iowa, enacting a stand-your-ground law, expanding the right of citizens to sue if they believe their Second Amendment rights are being infringed, and expanding the gun rights of minors, among several other provisions. In December 2016, Branstad was chosen by President-elect Donald Trump to serve as US Ambassador to China, succeeding Max Baucus. Branstad accepted the offer within one day after meeting with President Trump in New York. Trump cited Branstad's decades of experience with China in his role as Governor of Iowa in choosing him for the role. Xi Jinping, China's paramount leader, considers Branstad an "old friend". Branstad's relationship with Xi stems back to 1985 when the Chinese President, then a young official from Hebei Province, headed a five-man agricultural delegation to Iowa. Branstad's hearing before the U.S. Senate Foreign Relations Committee was held on May 2, 2017. Branstad was confirmed by the Senate on May 22, 2017, in an 82 to 13 vote. He resigned as governor on May 24, 2017, in a ceremony at the Iowa State House, and was immediately sworn in as U.S. Ambassador to China. His appointment marked the third time in a decade that a politician resigned a statewide office to become the Ambassador to China; Jon Huntsman Jr. resigned as Governor of Utah in 2009, and Max Baucus resigned as U.S. Senator from Montana in 2014. Lieutenant Governor Kim Reynolds succeeded him as Iowa Governor. In his capacity as Ambassador, Branstad is poised to make progress on cooperation and collaboration between the U.S. and China on various issues, including North Korea tensions. Branstad married Christine Johnson on June 17, 1972. They have three children and seven grandchildren. Christine has worked as a medical assistant and as a volunteer at schools and hospitals. Branstad is a member of the Ancient and Accepted Scottish Rite of Freemasonry. He received the honor of "Knight Commander of the Court of Honor" in 2015. In December 2015, a biography of Branstad entitled Iowa's Record-Setting Governor: The Terry Branstad Story was released. The book, written by longtime newspaperman and Iowa historian Mike Chapman, details Branstad's youth on the family farm, his high school days in Forest City, and his rise in the political world. ^ Branstad's maternal grandfather, Louis Edward Garland, is an Anglicized spelling of Louis Edward's grandfather Leib Yitzhak Garfinkel who lived in the Pale of Settlement in Russian Empire in the late 19th century. Leib Yitzak's father was Zelig, grandfather was Nakhman, and great-grandfather was Leib, born in 1735. Leib Yitzak's son was Nakhman Garfinkel. His sons Max Hyman (later "Harry") Garland and Louis Edward Garland immigrated to the United States from their native town of Vagova, Lithuania, arriving December 7, 1907, aboard the Celtic in New York City after sailing from Liverpool. These brothers listed their race as "Hebrew". Later, the Garlands settled in Council Bluffs. Max is Merrick Garland's grandfather. ^ "2010 Official Canvass by County - Governor" (PDF). Iowa Secretary of State's Office. November 29, 2010. Retrieved October 6, 2014. ^ a b "Iowa Election Results 2010". The New York Times. Retrieved October 6, 2014. ^ "Terry Branstad Is Now The longest-serving governor In American History". The Huffington Post (archived). Associated Press. December 14, 2015. Archived from the original on January 2, 2016. Retrieved December 15, 2015. ^ Jacobs, Jennifer (December 6, 2016). "Trump Picks Iowa Governor Branstad as China Ambassador". Bloomberg News. New York. Retrieved December 7, 2016. ^ "U.S. Political News, Opinion and Analysis - HuffPost Politics". Politicsdaily.com. Retrieved February 8, 2016. ^ "Edward Branstad (1924-2013)". Governor.iowa.gov. July 26, 2013. Retrieved February 8, 2016. ^ "What if Terry Branstad were a Jewish Latvian? - Daily Times Herald". carrollspaper.com. Retrieved February 20, 2017. ^ "Gov: Knocking down commercial property tax a priority in 2012". Carrollspaper.com. November 22, 2011. Retrieved February 8, 2016. ^ McKinney, Kait (March 16, 2016). "Branstad Has Unique Connection to SCOTUS Nominee Merrick Garland". WHO-HD Channel 13. ^ a b c d e f g Margolick, David (March 18, 2016). "What's in Merrick Garland's Name?". Tablet. Archived from the original on March 24, 2016. Retrieved March 9, 2017. ^ a b Nathan-Kazis, Josh (March 16, 2016). "Merrick Garland Offers Poignant Story About Anti-Semitism as Supreme Court Battle Looms". The Forward. Archived from the original on March 20, 2016. Retrieved March 9, 2017. ^ a b c Garland, Max (April 14, 1936). "Declaration of Intent: citizenship application". United States Department of Labor Immigration and Naturalization Service. Chicago, Illinois. Retrieved March 9, 2017. ^ "Alumni Awards | Department of Political Science | College of Liberal Arts & Sciences | The University of Iowa". clas.uiowa.edu. Retrieved February 20, 2017. ^ a b "Governor Terry E. Branstad (IA)". Project Vote Smart. Retrieved January 15, 2011. ^ "VETERANS DAY: Honoring Our Heroes". Whotv.com. November 11, 2013. Retrieved February 8, 2016. ^ "Gov. Terry Branstad". Togovern.com. Retrieved November 2, 2013. ^ "Landmark longevity: Branstad seals governor tenure record". Des Moines Register. Retrieved February 20, 2017. ^ "Branstad Vetoes State Lottery". The Daily Record. June 1, 1983. Retrieved July 19, 2013. ^ "Iowa reports lowest unemployment rate in 1999 : The Economics Daily : U.S. Bureau of Labor Statistics". www.bls.gov. Retrieved February 20, 2017. ^ "Gov. Terry Branstad | Office of the President". www.president.iastate.edu. Retrieved February 20, 2017. ^ "The Daily Reporter - Google News Archive Search". Retrieved July 19, 2013. ^ "About the Governor ★ Governor Branstad". Governor.iowa.gov. Retrieved July 19, 2013. ^ "Fact Check: Culver and Branstad turn hostile over budget records". Iowa Independent. January 21, 2010. Archived from the original on July 15, 2012. Retrieved July 19, 2013. ^ "The Des Moines Register from Des Moines, Iowa on May 18, 2014 · Page I5". Newspapers.com. Retrieved February 21, 2017. ^ "Terry Branstad Elected to AICPA Board of Directors". www.businesswire.com. Retrieved February 21, 2017. ^ "Terry E. Branstad: Executive Profile & Biography - Bloomberg". www.bloomberg.com. Retrieved February 21, 2017. ^ "Des Moines University President Terry Branstad retires - DMU News & Events". Dmu.edu. October 16, 2009. Retrieved August 29, 2010. ^ "Archived: Governor Terry Branstad of Iowa – Chair of the President's Commission on Excellence in Special Education". President's Commission on Excellence in Special Education. United States Department of Education. December 13, 2001. Archived from the original on October 7, 2002. Retrieved November 2, 2013. ^ "2011- Terry Branstad · Iowa Heritage Digital Collections". www.iowaheritage.org. Retrieved September 22, 2016. ^ "2009-2010 AICPA Board of Directors". Aicpa.org. September 18, 2006. Retrieved August 29, 2010. ^ globalreach.com, Global Reach Internet Productions, LLC - Ames, IA -. "Board Members - Living History Farms". www.lhf.org. Archived from the original on February 22, 2017. Retrieved February 21, 2017. ^ "Branstad Files Paperwork for Gubernatorial Run". Theiowarepublican.com. October 7, 2009. Archived from the original on March 6, 2010. Retrieved August 29, 2010. ^ Beaumont, Thomas (September 19, 2009). "Culver rating slips; poll gives Branstad positive signs". Des Moines Register. Archived from the original on June 29, 2013. Retrieved February 15, 2010. ^ "Republicans Nominate Branstad for Iowa Governor". KCRG.com. June 8, 2010. Archived from the original on July 15, 2012. Retrieved June 8, 2010. ^ ‘The new Vander Plaats question: Will he back Branstad?’ Archived January 21, 2013, at Archive.today, blog post by Reid Forgrave, The Des Moines Register, June 8, 2010. Retrieved June 9, 2010. ^ "Des Moines Tea Party Credibility Questioned Following Candidate Report Card". Theiowarepublican.com. Archived from the original on June 8, 2010. Retrieved August 29, 2010. ^ "Home - The Des Moines Tea Party". The Des Moines Tea Party. April 15, 2009. Archived from the original on November 4, 2013. Retrieved November 2, 2013. ^ Clayworth, Jason (June 12, 2010). "Accounting controversy still dogs Branstad". The Des Moines Register. Des Moines, Iowa. p. A.1. Archived from the original (Abstract) on 2013. Retrieved November 2, 2013. ^ "HAYWORTH: Republican Hoefling aiming to challenge Branstad in 2014". Sioux City Journal. March 4, 2014. Retrieved December 24, 2014. ^ a b Agency, Iowa Legislative Services. "Iowa Legislature - BillBook". www.legis.iowa.gov. Retrieved February 21, 2017. ^ "Hatch, Branstad differ widely on economy". Lansing State Journal. Retrieved February 21, 2017. ^ a b "UPDATE: Often rancorous Iowa legislative session praised for results | Political News | wcfcourier.com". wcfcourier.com. Retrieved February 21, 2017. ^ Thomas, G. Scott (June 27, 2013). "How state governors rank on their job-growth record". The Business Journals. Retrieved November 3, 2015. ^ Thomas, G.Scott (June 27, 2013). "28. Terry Branstad -- Governors ranked by their job-creation records". The Business Journals. Retrieved November 3, 2013. ^ "GOP's state trifecta has its own challenges 'It's not all roses and sunshine,' recalls leader from 20 years ago | The Gazette". The Gazette. Retrieved February 21, 2017. ^ Russell, Joyce (November 9, 2016). "Iowa Senate Turns Republican in Tuesday Voting". Iowa Public Radio. Retrieved April 29, 2017. ^ De Lea, Brittany (April 13, 2017). "Iowa Passes Massive Expansion of Gun Rights, More States to Follow?". Fox Business Network. Retrieved April 29, 2017. ^ a b Hanson, Alex. "Branstad chosen as Chinese ambassador; Reynolds to become first female governor". Iowa State Daily. Retrieved February 21, 2017. ^ V.V.B. (December 8, 2016). "Damage control: An "old friend" of Xi Jinping will be America's next ambassador to China". The Economist. Retrieved December 10, 2016. ^ "Xi to revisit Iowa after memorable trip 27 years ago|Center|chinadaily.com.cn". usa.chinadaily.com.cn. Archived from the original on March 1, 2018. Retrieved February 28, 2018. ^ Pfannenstiel, Brianne (May 2, 2017). "Iowa Gov. Terry Branstad draws praise in hearings to be ambassador to China". USA Today. Retrieved May 12, 2017. ^ "PN52 - Nomination, 115th Congress (2017-2018)". www.congress.gov. May 22, 2017. Retrieved June 11, 2017. ^ "Branstad: 'North Korea Is the Biggest Threat to Humankind'". Time. Retrieved February 28, 2018. ^ "Iowa's Record Setting Governor: The Terry Branstad Story". Business Record. December 16, 2015. Retrieved October 13, 2017. ^ "Election Results > US Gubernatorial Elections, 1982 statistics - states compared - StateMaster". statemaster.com. Retrieved June 7, 2010. ^ "Iowa Legislature Heritage : Compound Object Viewer". contentdm.legis.state.ia.us. Archived from the original on July 25, 2011. Retrieved June 7, 2010. ^ "1990 Gubernatorial General Election Results - Iowa". uselectionatlas.org. Retrieved June 7, 2010. ^ "1994 Gubernatorial General Election Results - Iowa". uselectionatlas.org. Retrieved June 7, 2010. ^ "Iowa Primary Election Results 2010". The Des Moines Register. Archived from the original on June 12, 2010. Retrieved June 9, 2010. ^ "Iowa Secretary of State, 2014 Primary Election Canvass Summary" (PDF). Retrieved February 20, 2017. ^ "Terry Branstad re-elected to historic sixth term". desmoinesregister.com. Retrieved November 6, 2014. Wikimedia Commons has media related to Terry Branstad. This page was last edited on 16 February 2019, at 12:29 (UTC).